Hey all you black thumb peeps! I have a gardening tutorial for you. This desktop succulent terrarium is hard to kill. It requires very little water and loves to be neglected. Best of all, you can put it together in less than 20 minutes! Fill the bottom of the glass bowl with sand and soil mixture. Fill the small jar with a sand and soil mixture. Plant your favorite succulent in the jar. 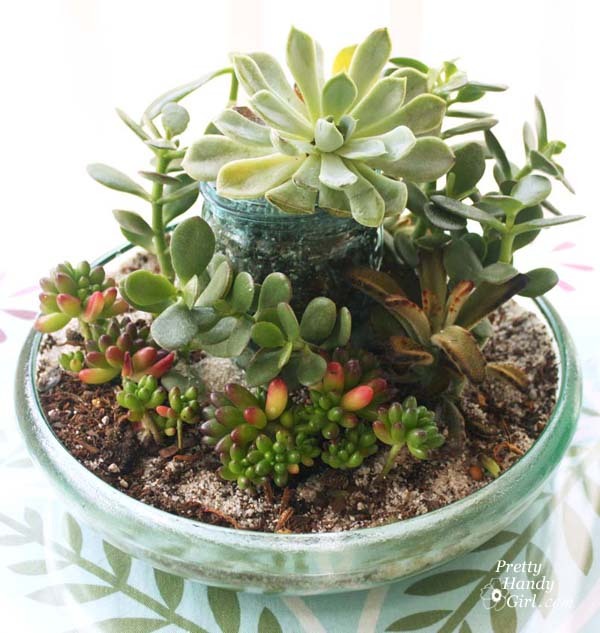 Fill the glass bowl with more soil, sand and succulents. Pour crushed glass on top of the soil for color. Add shells on top of the glass. I chose to change the finial on my cloche terrarium. It’s just a standard lamp finial. You can purchase a variety of finials in the lighting department at Lowe’s. The simple finial doesn’t distract from those beautiful succulents! Water your succulent planter then let it fully dry out before watering again. If the glass fogs, remove the cloche a while since succulents like dry conditions. Hi I don’t know if this forum is even still active, but if u do see this – all other I structures I have seen say that it’s imperative to use charcoal…. Do u think it’s really essential? Did your finial have a screw under it so you could change them out? I generally use E6000 to attach knobs to glass and I know you couldn’t exchange it if you had glued it on. I like this idea a lot. I can’t have live plants in my house because our cat chews on them. By using this cloche, I could have these succulents on a table and he wouldn’t be able to chew on them. No, but it’s a threaded finial from the lamp department. I bet you could find a nut that fits.